The art group known as Grupo 68 was founded in 1967 and initially comprised Peter Huf, his wife Eunice (Hunt) Huf, Jack Rutherford, John Kenneth Peterson and Shaw (the artist Don Shaw). Jack Rutherford dropped out after about a year, but the others remained as a group until 1971. Grupo 68 exhibited regularly (most Sunday afternoons), from early in 1968, at the Hotel Camino Real in Guadalajara, at the invitation of the hotel’s public relations manager Ray Alvorado (a singer) and also held many group shows in Ajijic, both at Laura Bateman’s Rincón del Arte gallery, as well as (later) in “La Galería”, the collective gallery they founded at Zaragoza #1, Ajijic. In addition, the group also showed in Guadalajara with José María de Servín, El Tekare, and at Ken Edwards store in Tlaquepaque. Grupo 68 came to an end when the individual artists went their separate ways. Jack Rutherford returned to the USA in 1971, and later settled in Spain. Peter Paul Huf and his wife Eunice Hunt returned to Europe in 1972, and at about the same time, The only member of Grupo 68 who remained in Ajijic was John K. Peterson, who subsequently joined with seven other artists – Sidney Schwartzman, Adolfo Riestra, Gail Michaels, Hubert Harmon, Synnove (Shaffer) Pettersen, Tom Faloon and Todd (“Rocky”) Karns – to form a new group known as The Clique Ajijic. January 1968 – 20 January 1968 – All four artists included in a group show at Ken Edwards (El Palomar), Tlaquepaque – 9 artists in total. Opened Saturday 20 January 1968. Artists: Eunice Hunt, Peter Paul Huf, Shaw, John Kenneth Peterson, Coffeen Suhl, Hector Navarro, Gustavo Aranguren, Rodolfo Lozano, Gail Michaels [“Michel” on invite]. 1968 – 1971 Camino Real Hotel, Guadalajara. Grupo 68 members held weekly shows most Sundays by the hotel pool. Participation varied, but usually included works by all four artists. October 1968 – Works of Jose María de Servín and Grupo 68, at Galería del Bosque, Calle de la Noche 2677, Guadalajara; opened 24 October 1968. All four members of Grupo 68 (Shaw, John Kenneth Peterson, Eunice Hunt, Peter Paul Huf) in a joint show, as part of the Cultural Program of the International Arts Festival for the XIX Olympics. February 1969 – Three of the Grupo 68 exhibited at the Tekare penthouse restaurant-gallery, 16 de Septiembre #157, 10th floor, Guadalajara; opened 4 February. Artists: Eunice Hunt, Peter Paul Huf, Shaw. April 1969 – All five members of the original Grupo 68 showed works in a collective exhibit that opened 18 April 1969 at La Galería, Ajijic. The announcement in Guadalajara daily Informador (20 April) lists the artists as John Kenneth Peterson, Charles Henry Blodgett (guest artist) and “El Grupo” (John Brandi, Tom Brudenell, Eunice Hunt, Peter Paul Huf, Jack Rutherford, Shaw, Cynthia Siddons and Robert Snodgrass). 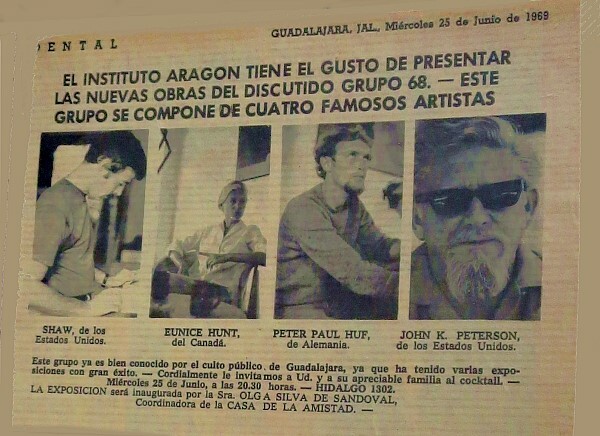 June 1969 – Grupo 68 show at Instituto Aragon, Hidalgo 1302, Guadalajara, opened 25 June. All four Grupo 68 artists (Shaw, Eunice Hunt, Peter Paul Huf, John Kenneth Peterson) were involved (see image). September 1969 – (3 September for a month) – Three Grupo 68 artists exhibited together at Galeria 1728 (owned by Jose María de Servin), Hidalgo 1728, Guadalajara. The show was entitled 7-7-7 (7 works each by Eunice Hunt, Peter Paul Huf and Shaw, the show’s title derived from the Olympics scoring system); opened on Wednesday 3 September. Peter Paul Huf and Eunice Hunt (interviewed in 2014); photos and gallery invitations in collections of Peter Paul Huf, Eunice Hunt, Tom Brudenell and others.